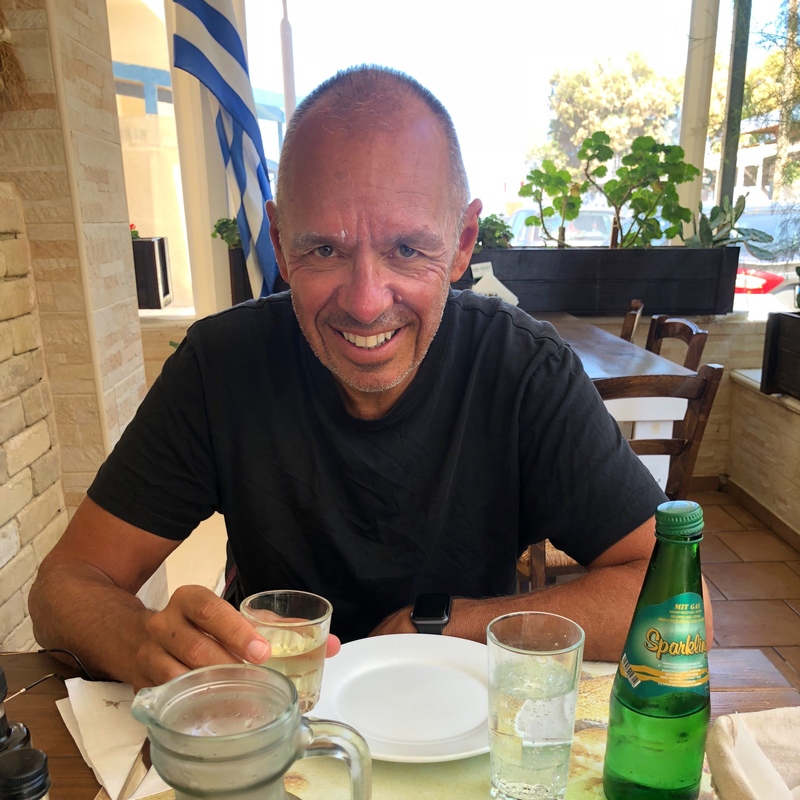 We were on our own for three days in Heraklion after Bart, Ann, Athena, and Ken went up into the mountains of Crete on their own. 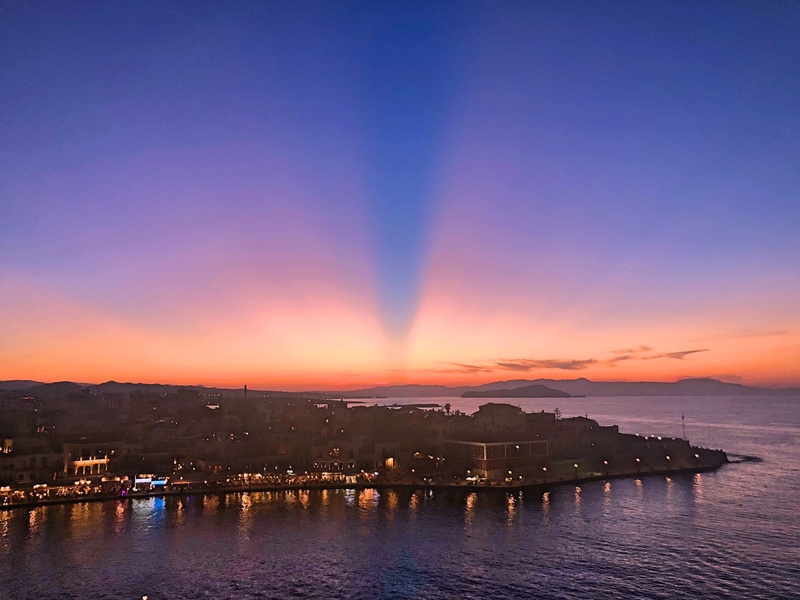 Known variously today as Heraklion, Heraclion, and Iraklion (all of which mean “the city of Heracles) it is the capital and largest city of Crete. As if the various names aren’t confusing enough, from the time of the Arab conquest of Crete in the early 9th century it was known as Chandax or Candie or Candia or Candy. All of which made learning the history of the city confusing. For me at least. 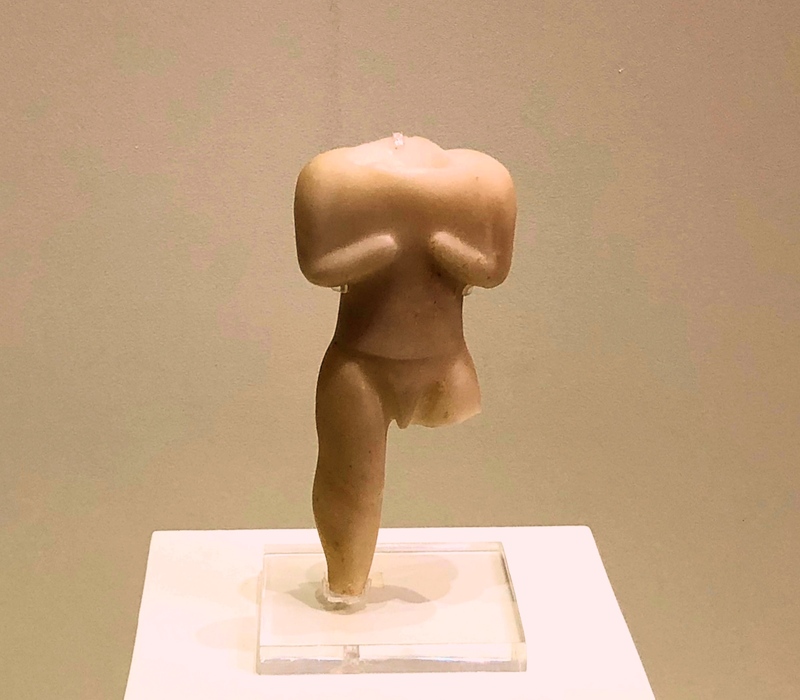 This little statue may not look like much but it dates back to 6,000 or even 6,500 BC. That’s old! But history is what you come here for quite nearby is the Palace of Knossos where the legendary King Minos’s Minotaur ate young Greeks. Knossos, originally settled as early as 7,000 BC may well have been Europe’s first city; the historian Will Durant called the Minoans “the first link in the European chain.” Now we didn’t actually go out to Knossos as we’d been there just a couple of years ago and my sense was that it hasn’t changed much in that period. 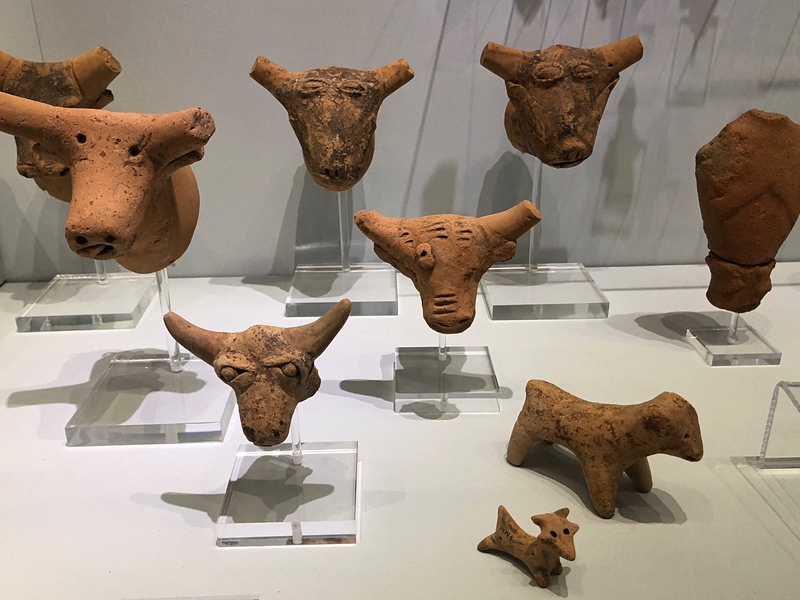 We did, though, go to the Heraklion Archeological Museum and enjoyed these crazy old pieces. And just by way of background I love the myth of the Minotaur. 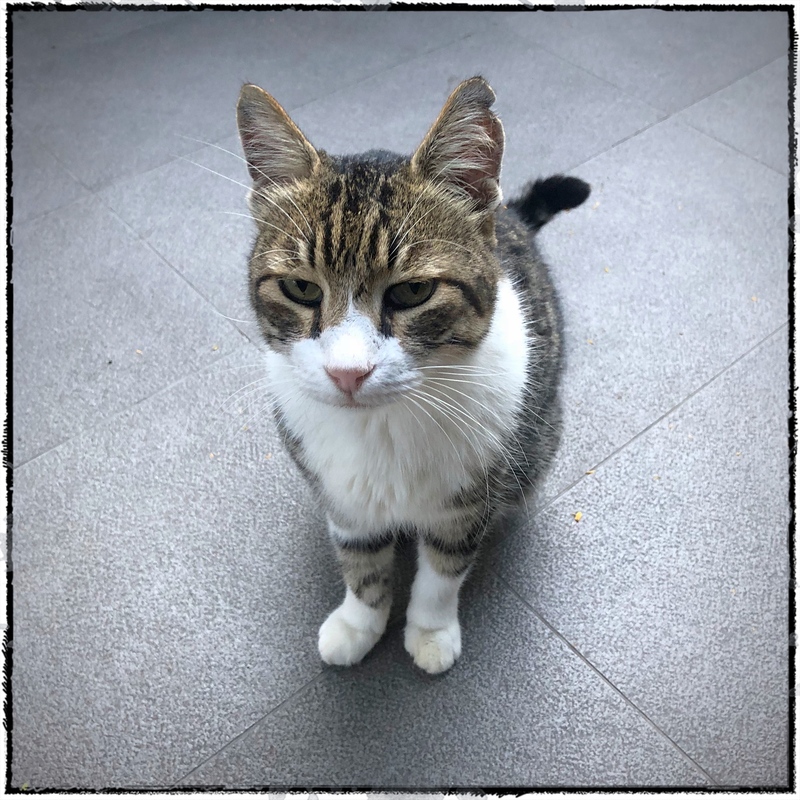 At some point, you see, King Minos of Knossos had pissed off the Greek god Poseidon by keeping a beautiful bull that he was supposed to have sacrificed. Poseidon got him back by making the wife of Minos fall in love with the bull, the offspring of which coupling was half bull and half man. 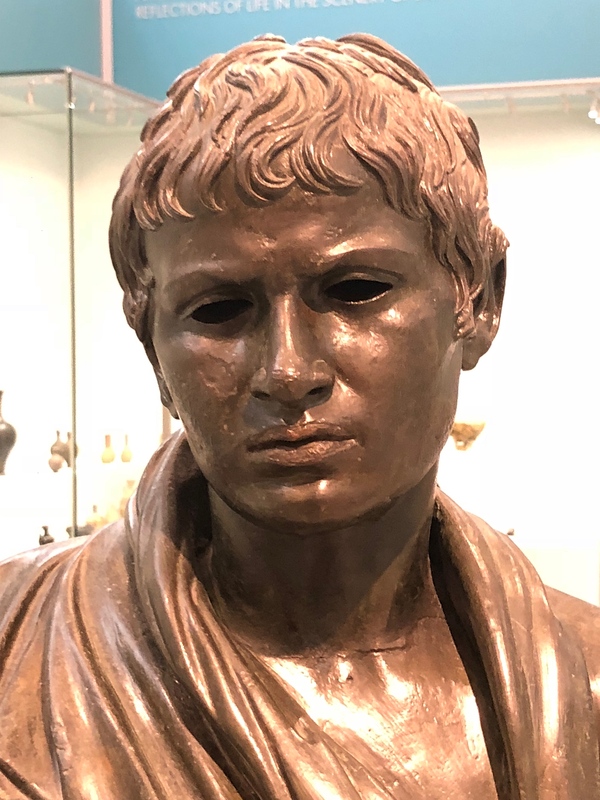 This Minotaur fed on humans and, after defeating the Athenians in battle Minos required the Athenians to send him seven youths every several years to keep the Minotaur satisfied. 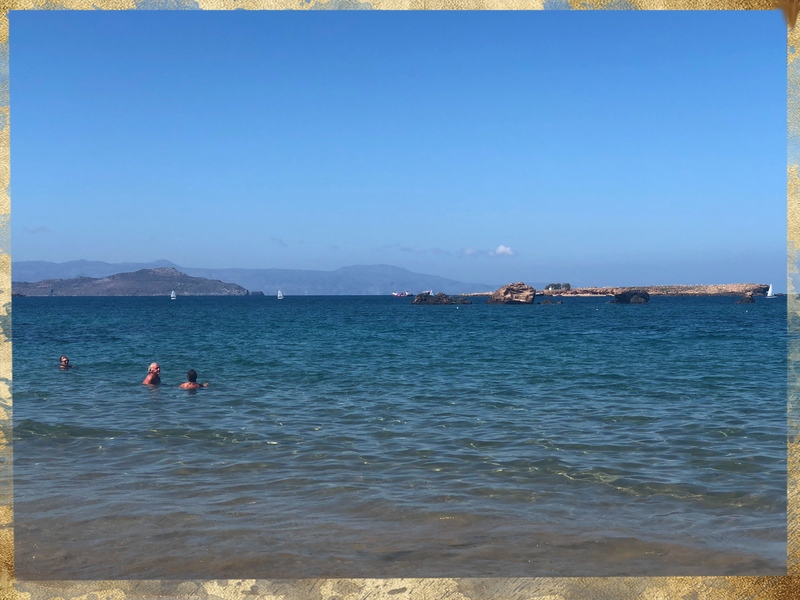 The story goes on – Ariadne falls in love with the Athenian Theseus and helps him kill the Minotaur, Theseus then dumps Ariadne and becomes King of Athens. They just don’t make stories like that any more. 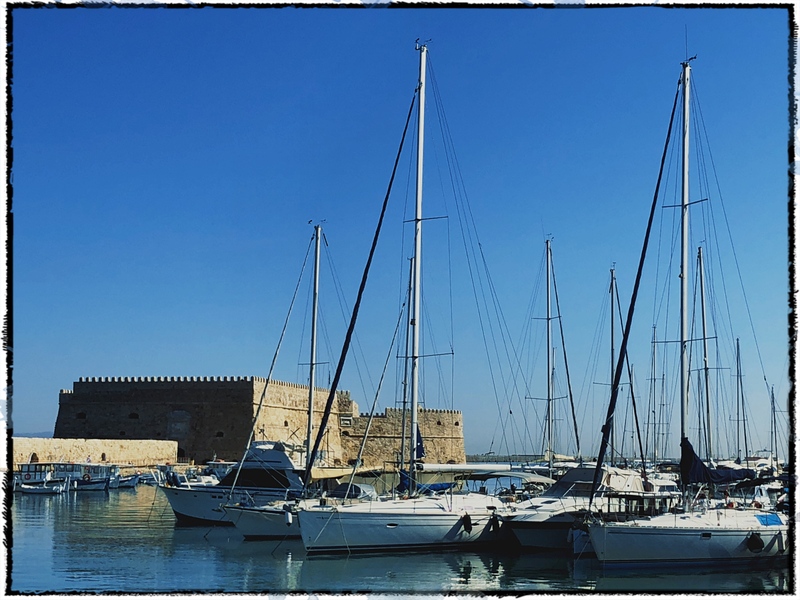 At any rate, we really liked Heraklion. 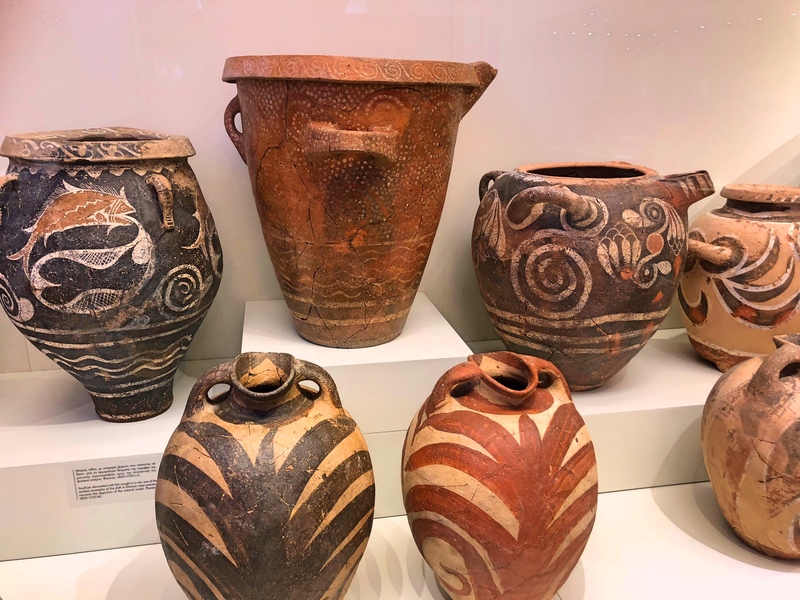 The Archeological Museum was very good and another museum of the history of Crete was pretty good. 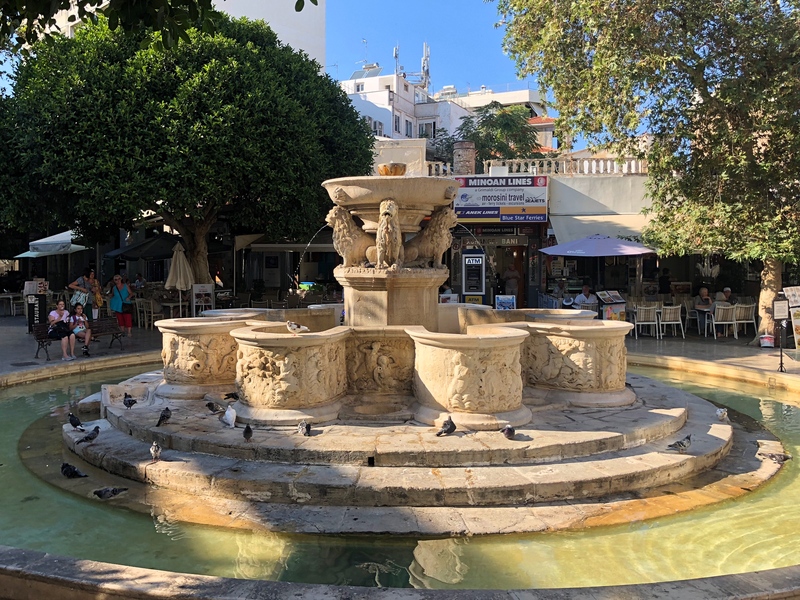 The city has some pretty serious artistic chops: the great author Nikos Kazantzakis (Zorba the Greek, Last Temptation of Christ) hailed from Heraklion as did the 16th century artist known as El Greco. 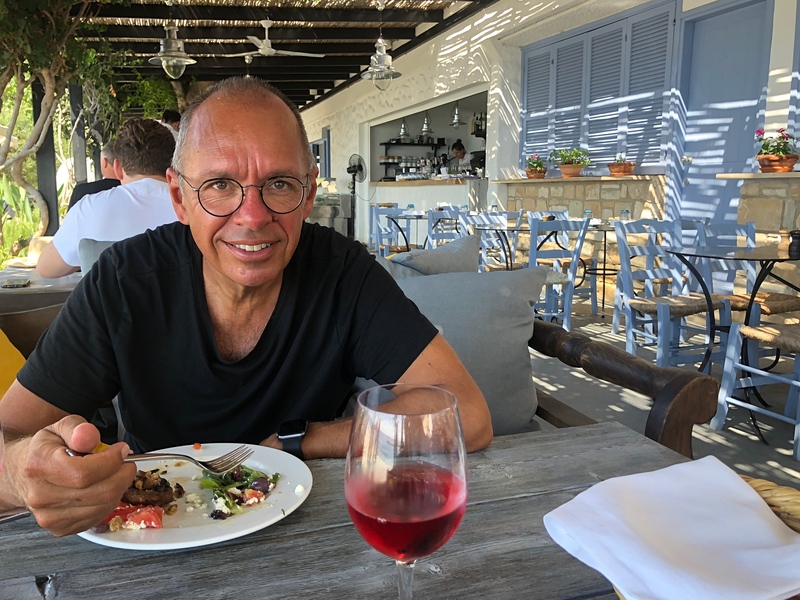 There was some great food – we had lunch at Peskesi twice, a place that serves authentic Cretan food, and thought it was one of the great restaurants we’ve ever eaten at; so good that we couldn’t get reservations for dinner – and much of the city center is a car-free pedestrian zone with lots of happening bars and restaurants. One day at an OK beach nearby and a couple Martinis one night that were worthy of anything Boston or New York could offer so that’s pretty much all you need in life. 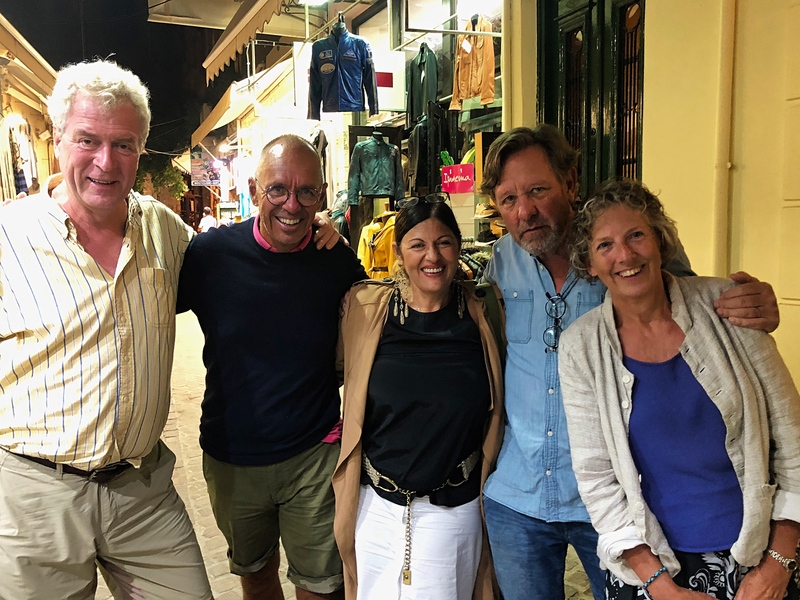 And then after a quick three nights we were moving on again, this time a little further east to Elounda, still on the north coast of Crete, to meet up with Bart and Ann again for a few days. 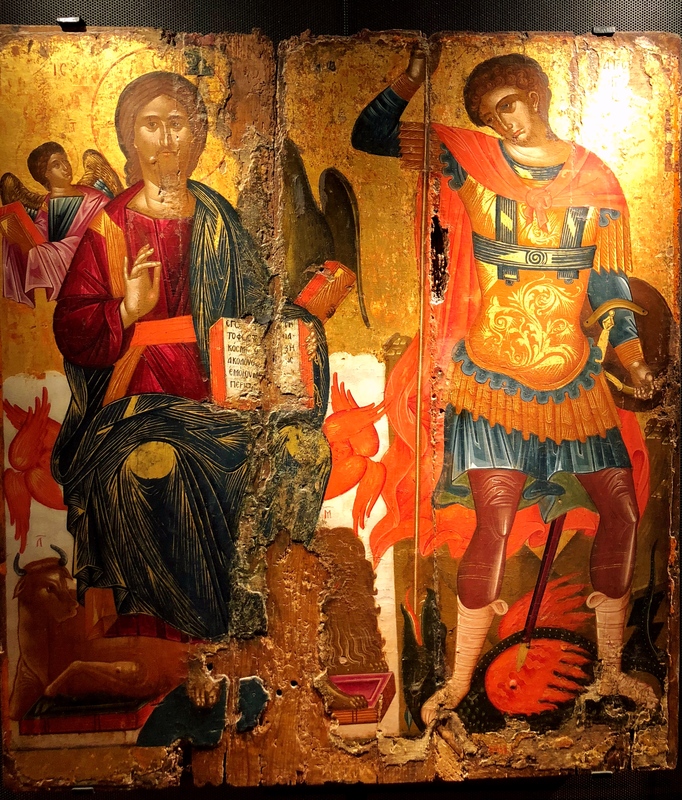 Speaking of El Greco, the Historical Museum of Crete holds the only two original El Grecos on his native island. This “View of Mt. 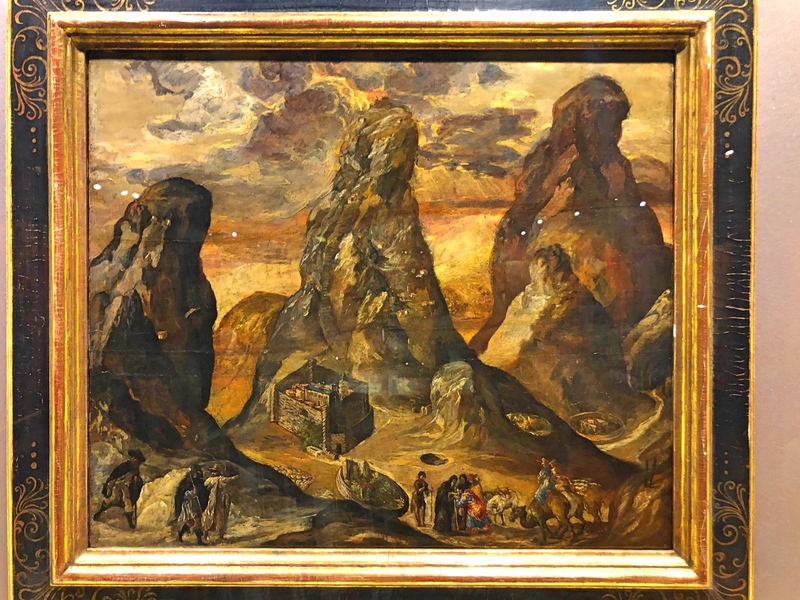 Sinai and Monastery of St. Catherine” dates from 1570 and for me at least evokes nothing so much as Van Gogh. It’s one thing to be ahead of your time but El Greco was hundreds of years ahead of his time. The Historic Museum of Crete had a room dedicated to old coins. 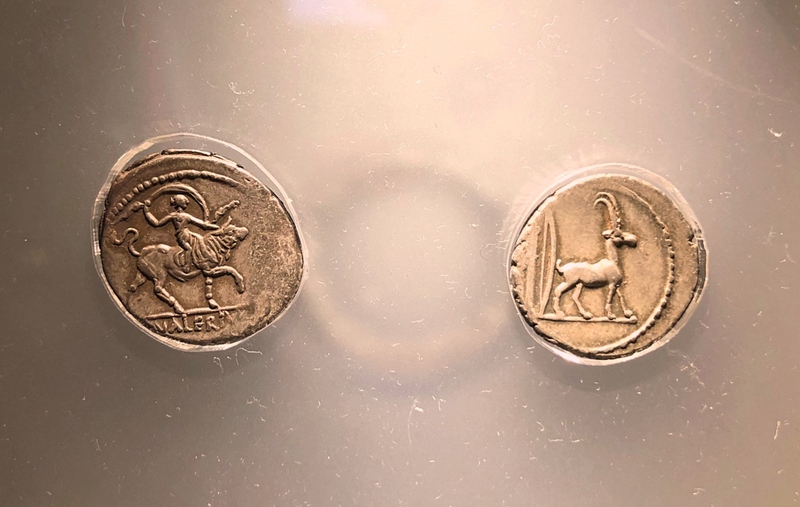 These are Roman coins from the first century BC but, though Roman, show Cretan myths; that’s Ariadne, daughter of King Minos, riding a bull. Our beach just a little outside of Heraklion. Not a great beach but good enough for a one-day stop. When we were visiting Boston last spring we pleaded with our old neighbors Bart and Ann to meet us in Greece this fall. They were interested but non-committal at the time. Some time later their friends from California, Ken and Athena, also prodded them to come to Greece. So they gave in and set plans in motion. 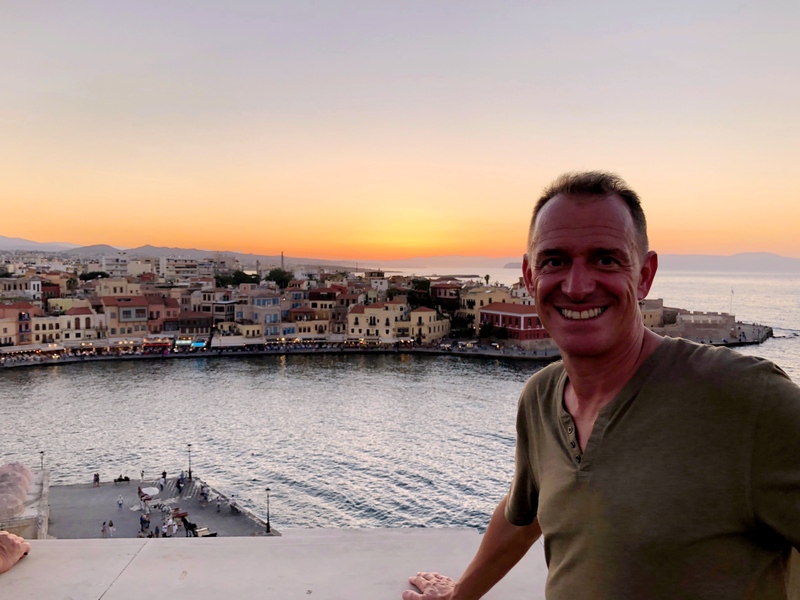 The result is that we all just flew into Chania, Crete and took up residence in a lovely apartment overlooking the harbor for a few days. 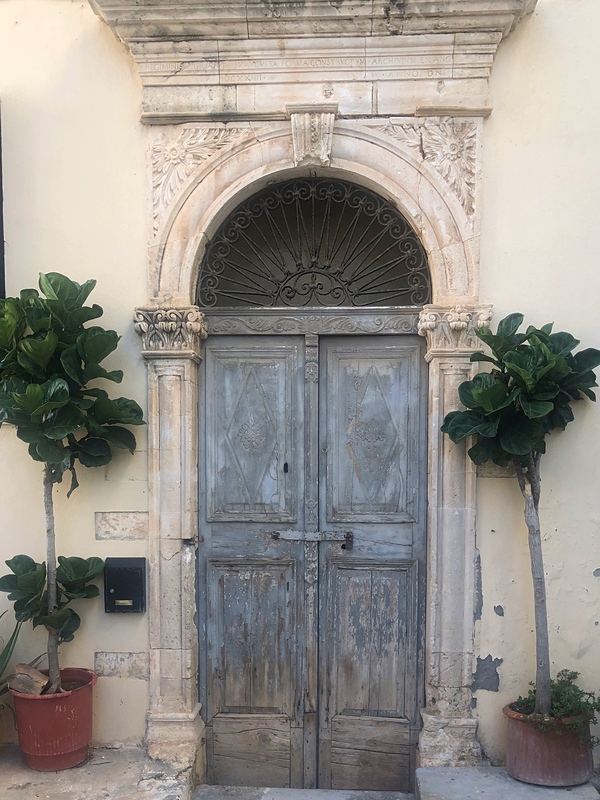 Elegant Venetian-era doorways in our neighborhood. This one features Roman script above the door. 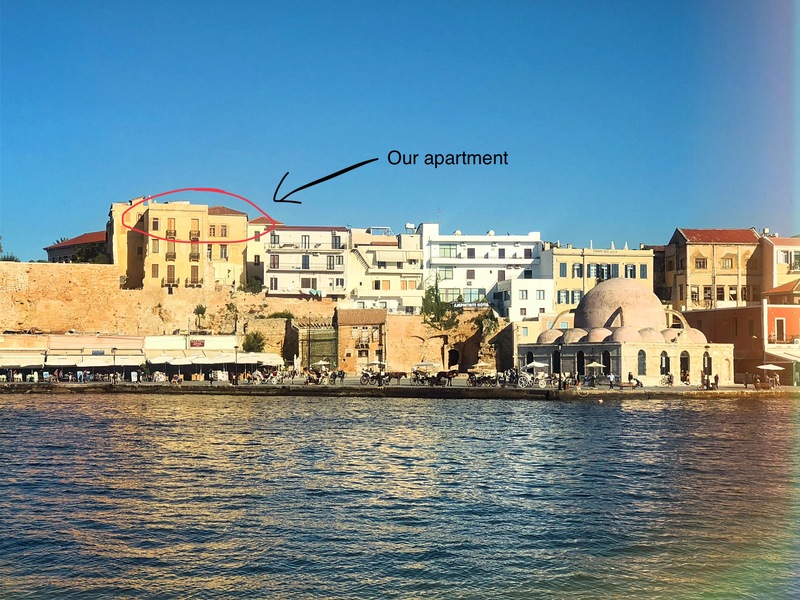 It was not just any old apartment, but part of a lovingly restored “palazzo” built on top of Chania’s Byzantine walls during the Venetian rule of Crete somewhere in the 13th to 17th centuries. 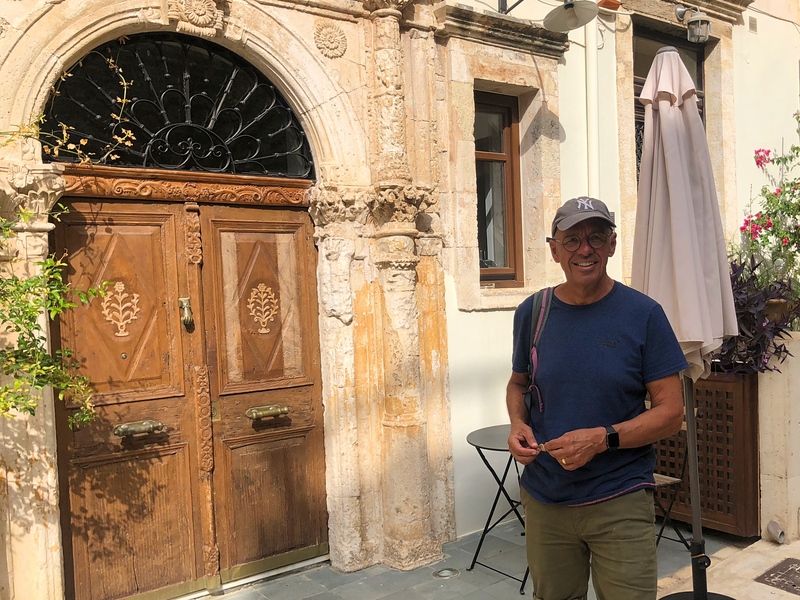 The building served as the residence of the Venetian rulers until Chania fell to the Turks in 1645, when it became the residence of the Turkish Pasha. The house survived heavy bombing in World War II and was eventually restored by an American painter named Dorothy Andrews. Today it is an elegant monument to all of those eras. 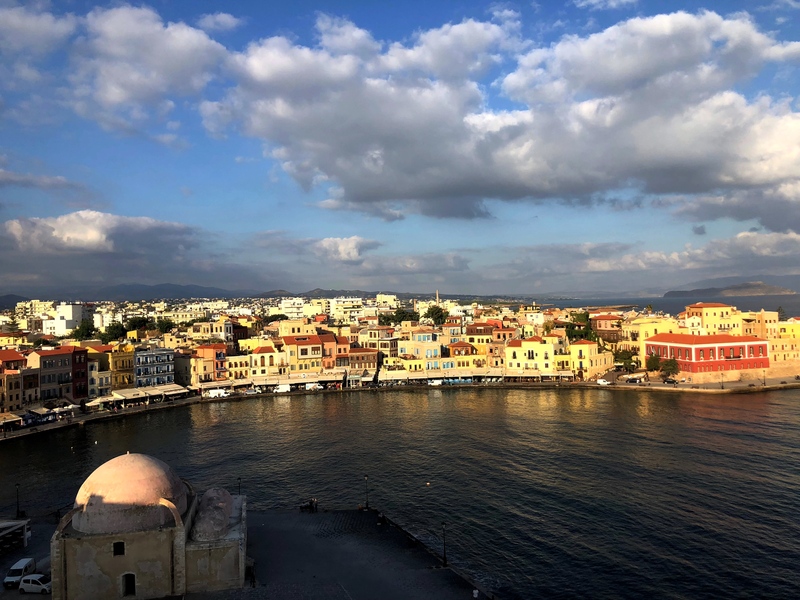 Our apartment’s stately rooms and huge rooftop terrace offered sweeping views of the Chania harbor. 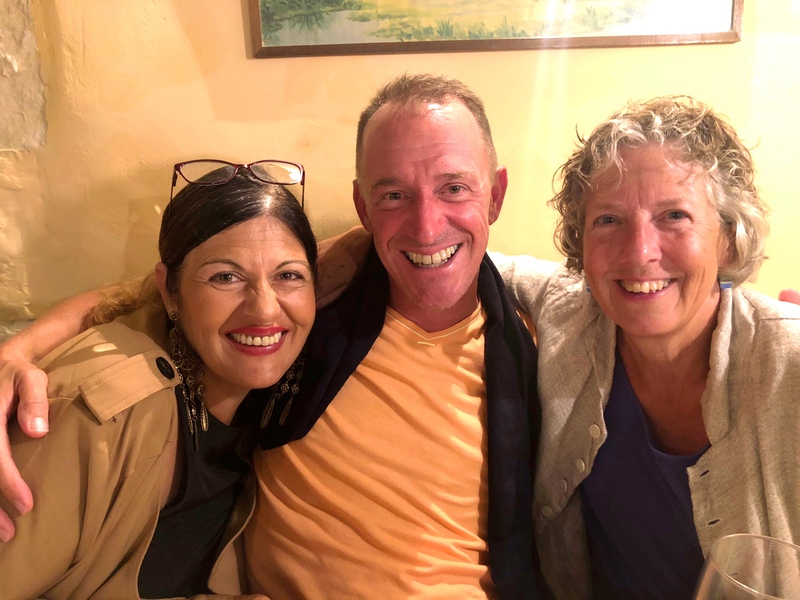 It was a wonderful place to reconnect with Ann and Bart — and to get to know their friends Ken and Athena. 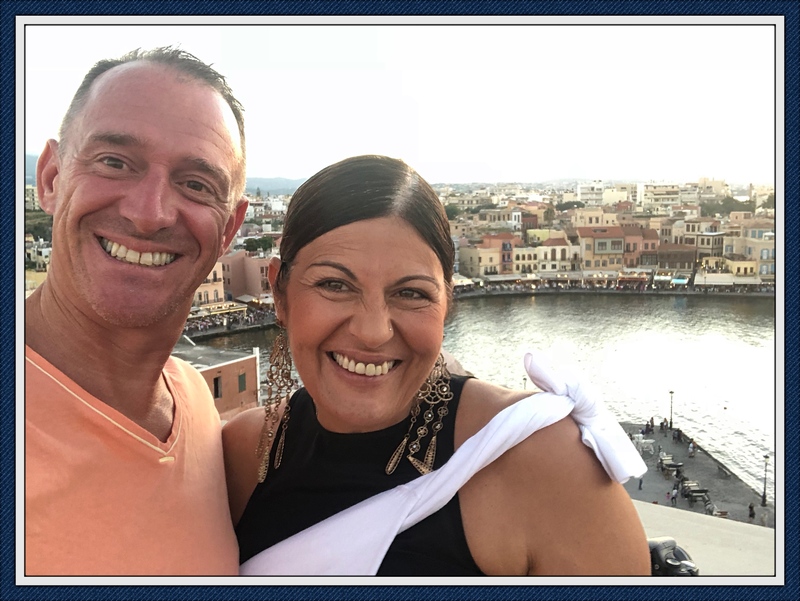 We also got lots of special insight into Greek food, language, and culture from Athena, who is a native of Greece and a very fun-loving person. (You might guess that Athena Georgakopoulos is Greek, no?) 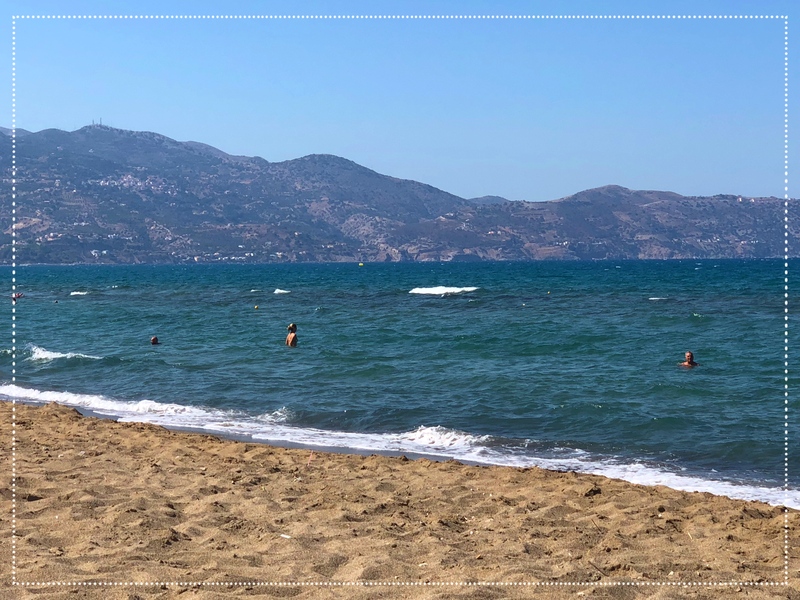 So we had a wonderful few days of socializing, playing cards, sitting on the beach, sipping wine, and exploring Cretan cuisine. 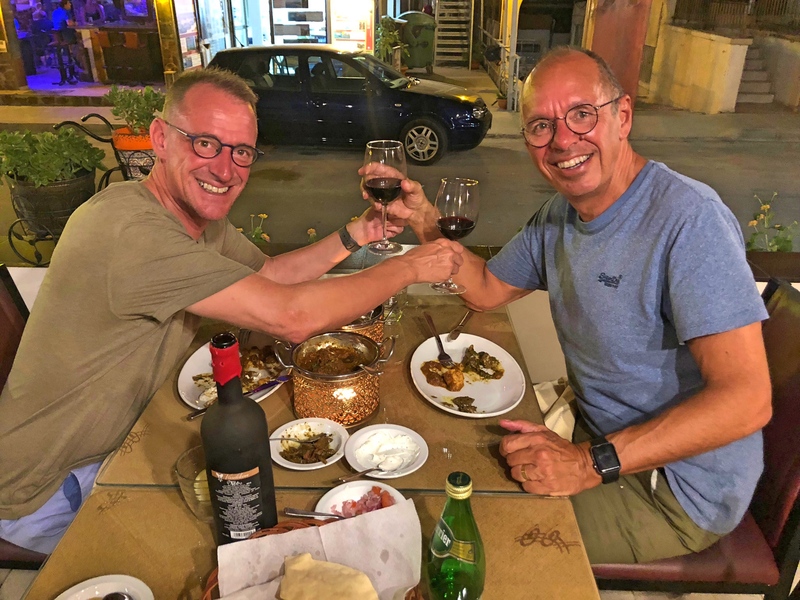 From here Jim and I will stop in the Cretan capital of Heraklion for a few days before rejoining Bart and Ann in the eastern part of the island. 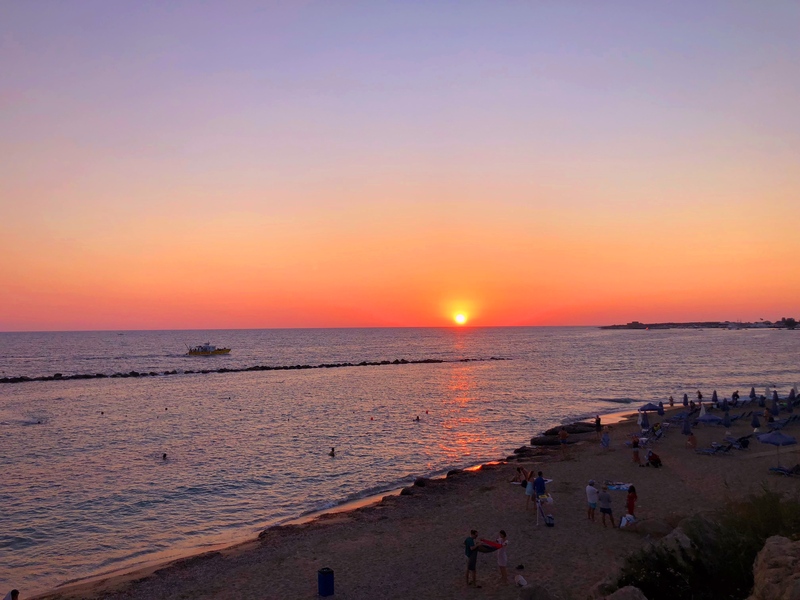 Our last stop in Cyprus was Paphos down in the southwest corner of the island. Just last year it was named a European Capital of Culture, though I can’t say I actually understand why. 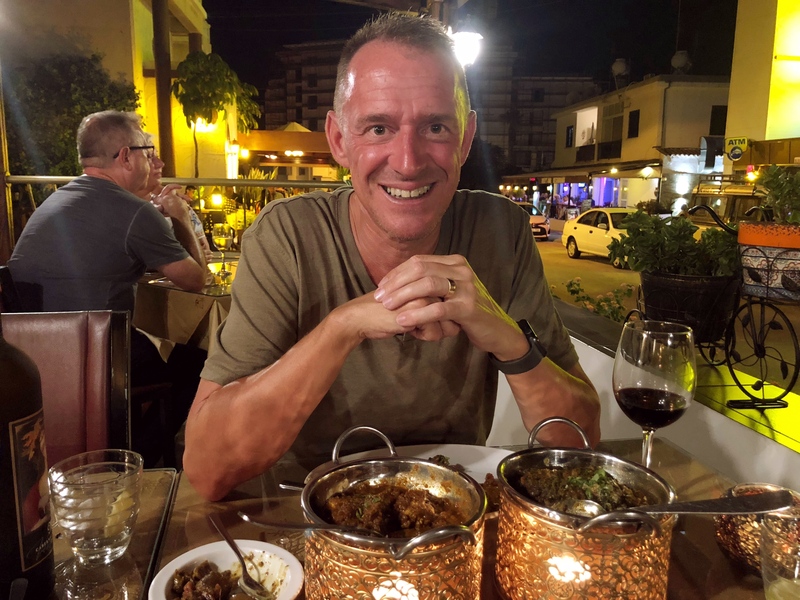 We enjoyed our stop – nice hotel, nice beach, good food, some good ruins, Mark found a little store where I could replace my dead iPad – but Capital of Culture? There were a lot of pubs and clubs but that isn’t normally what I would expect from a Capital of Culture. At any rate, it was a good stop. 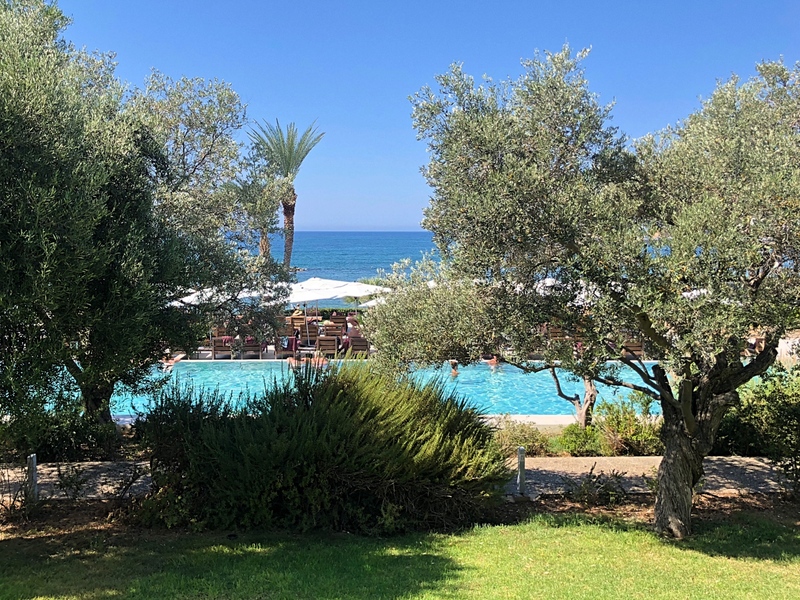 Our hotel, Almyra, was right on the coast and while it didn’t have a beach per se, the pool was nice, the sun beds had good views, and the food at the Greek restaurant was fantastic. 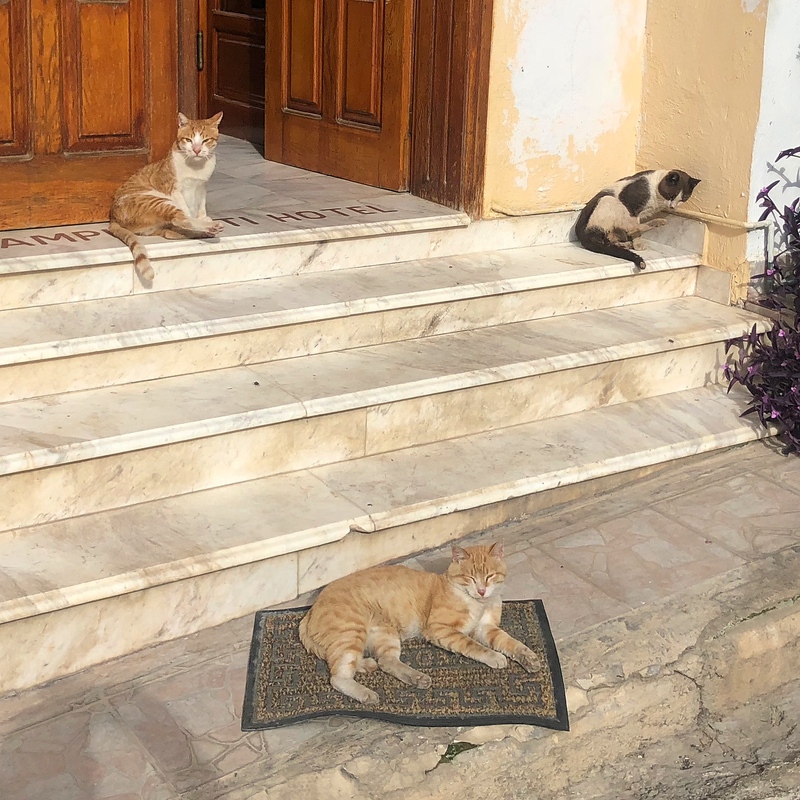 Along with cats everywhere and a nice Indian restaurant for dinner, what more do you need? 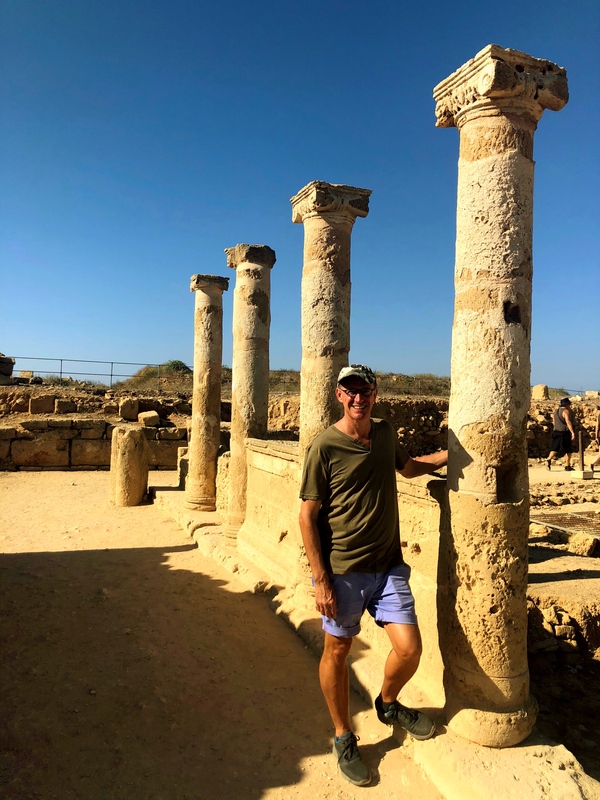 Like so many places in this region Paphos has some interesting history. It was in Paphos, for instance that one Saul of Tarsus passed through and (allegedly) converted the Roman proconsul to Christianity. And it was here that Saul was first identified as Paul in the New Testament book Acts of the Apostles. How’s that for history? 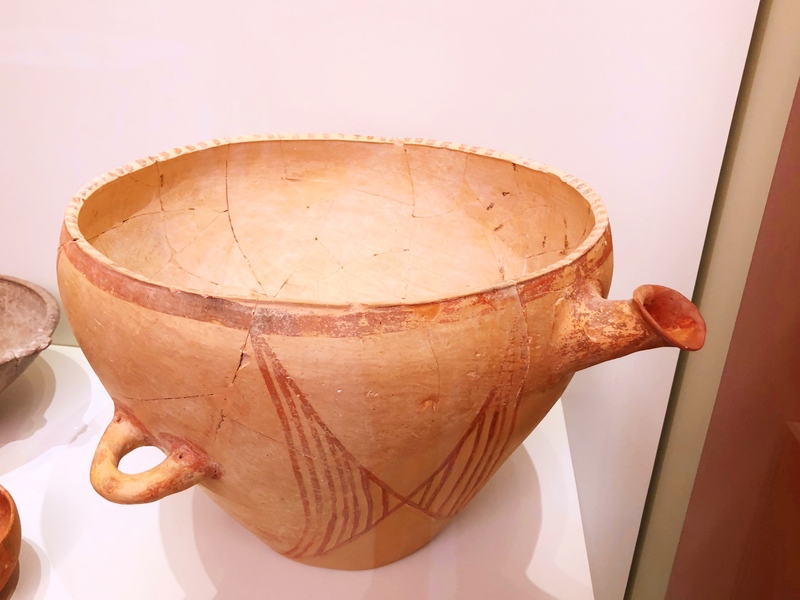 The major tourist attraction in town – besides just the sea and harbor and all that – and the reason Paphos is a UNESCO World Heritage Site is the Paphos Archeological Park. 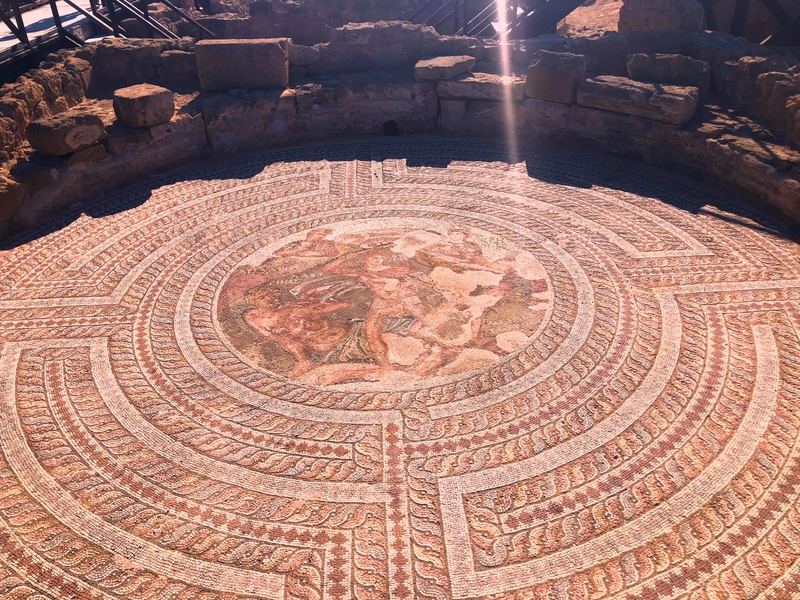 Over the last several decades they have unearthed four major Roman villas, each with substantial mosaic floors that were buried for many hundreds of years. 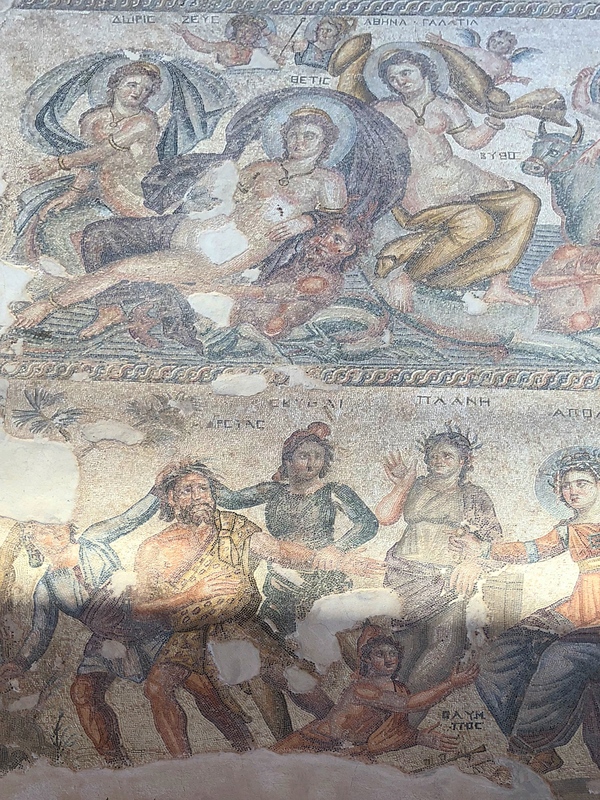 To be honest those mosaics were really the only part we found interesting in the old ruins, but they were worth, you know, 45 minutes of your life. Just one part of a mosaic floor in one of the old Roman villas. This one depicts the duel between Theseus and the Minotaur on the island of Crete (our next stop). It is surrounded by decorative zones that represent the Minotaur’s Labyrinth. 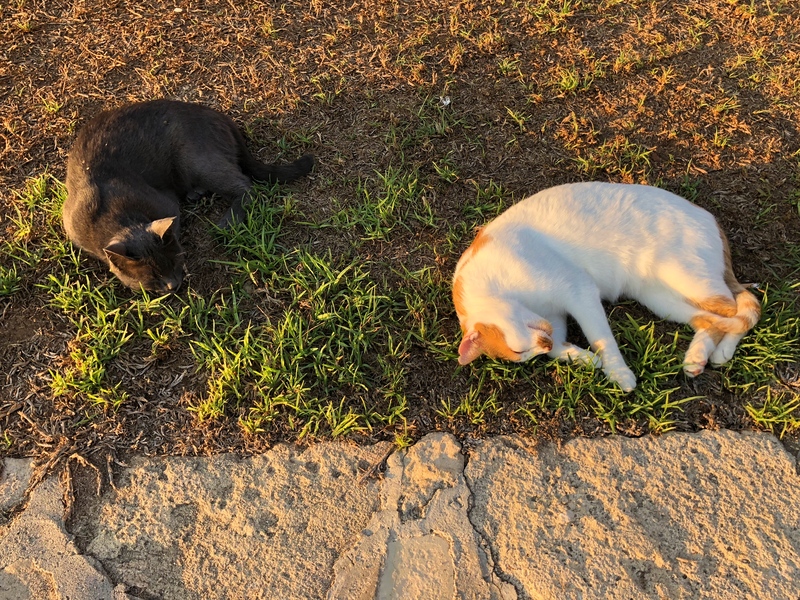 And thus ends our two-week, five-stop tour of Cyprus. Between the sea, the beaches, the history, the cats, and the food, it was definitely worth the time. And great value, too. Oh, and one last strange thing to note. It seemed as though all the taxis on the island, perhaps every one that we used as we moved from place to place, were Mercedes Benzes. And not old, crappy cars; they were comfy luxury cars. I don’t understand the economics of that but it sure made our drives around the island pleasant. Now we’re off to Crete to spend time with friends. 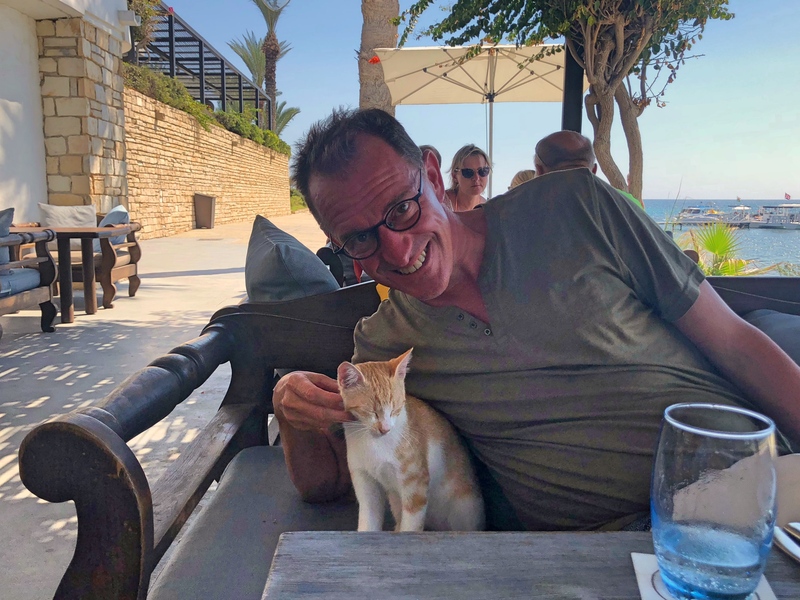 Mark and a cat at the seaside Greek restaurant in our hotel. We ate lunch here five times – every day – and never tired of it. 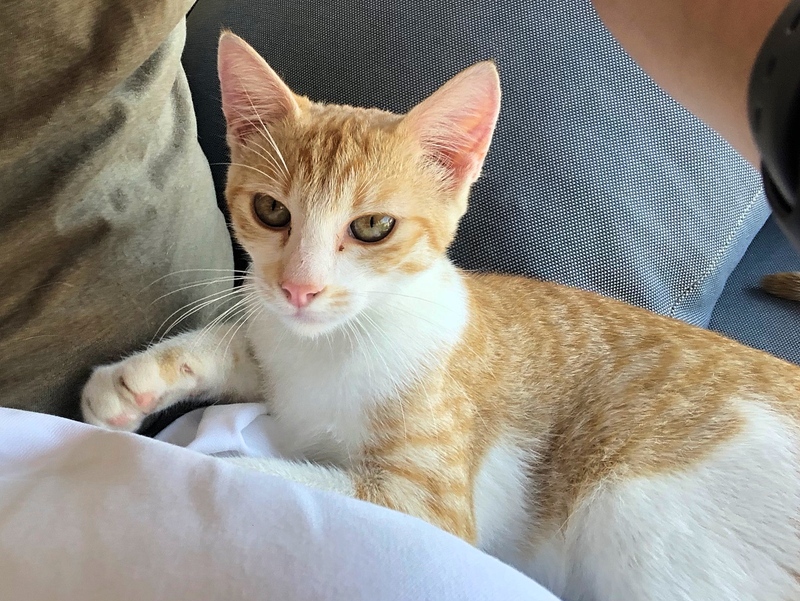 The cat was cute, of course, but when the food came she wasn’t quite so cute.